Pay x Weight or else! Considering it took the current Fianna Fáil / Fine Gael minority led government just 60 days to come to an agreement to try to run the country following the general election in February, it is amazing that they could agree to disagree on the Pay x Weight issue in just 10 days, and handle it so badly. Since the water charges issue which again was handled with the Natzi Style ‘You will do what you’re told‘ attitude by Phil Hogan, followed by ‘You simply have to pay‘ attitude of Alan Kelly, the Pay x Weight issue had the potential to raise the Ire of the Irish people like never before and possibly bring down this government unless it was kicked to touch quickly. Martin O’Neill and Roy Keane Ireland’s soccer team coach and manager may well have been coaching the government especially on their kicking to touch skills over the 10 days and prior to Ireland securing its place for the first time in the top 16. 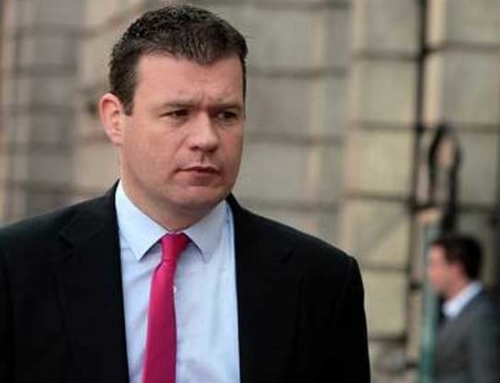 The long ball of Pay x Weight was delivered by Alan Kelly to the left foot of Enda Kenny (aka Homer Simsons moment of can’t someone else do it? ), completely blind sided and since there was no Environment Minister as Enda had abolished that post he had to pass it quickly but to who, who?. 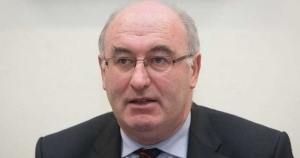 Phil Hogan that created the whole waste issue and the water issue, he was in Europe smiling like a Cheshire cat (Enda remembering that he had sent him there), Alan Kelly the architect was Offside (gone to the other side shouting it’s not my fault) with (Enda thanking god Kelly had lost the Labour leaders vote), so Enda in his panic said in the Dáil that he was delegating this important issue that was affecting the ‘Irish Peepill ‘so badly to Simon Coveney the Minister of, eh the Minister of eh! eh! Housing, yes Housing. So in true Irish political style and safest soccer maneuver Covney with a sure right foot, kicks the ball to touch and nominates Denis Naughton TD with the re enacted title of ‘Environment‘ in his brief to throw the Pay x Weight ball back into play in about 12 months time, assuming the current government is still around then or that there has not been a reshuffle. Coveney ushers a sigh of relief certain that Fianna Fáil would on this occasion allow the dog to wag its own tail and give Coveney’s kick to touch their full support. Assuming it was all sorted and the public would be watching Ireland playing Belgium or Italy or some bloody team, that would get their minds off Pay x Weight Coveney went back to being housing Minister again. 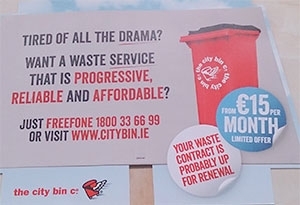 However he had one last swipe at the Low Cost Base refuse collectors (eg those who provided waste collection services for unsustainably low prices City Bin etc) saying those refuse companies that had increased their data bases by offering low cost collections, they were not his problem and basically he had no sympathy for them. 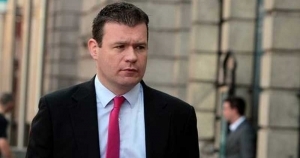 One would have to agree with him on this however as Greyhound inherited hundreds of unpaid accounts from Dublin City Council, along with waivers. In addition to combat the military precision style way that City Bin sought to take out Greyhound’s customers, Greyhound found themselves having to offer many of their clients the same deal as City Bin to get them to return. City Bin had their fleet burnt out during their start up phase too, so not everyone wanted to see them succeed. Although well intentioned Coveney’s swipe was a blunt instrument that was felt by more than those he intended to hit, and as both Greyhound and City Bin were not members of IWMA they were exempt from any agreement Coveney had with IWMA. Extra time is always scarey. O’Connor started her own Mexican wave of ideas in the Senate. Free nappy collection for all HSE home based patients, Waivers for families with babies and sure while we’re at it let’s get those in apartments a deal too. Cowen gets to hear of her rantings and has a go at Coveney and Naughton over the same issues and adds that there be a whole root and branch review of the whole waste industry. With the ink hardly dry on the long drawn out programme for government suddenly new items on it never heard of before were coming to the fore. Cowan citing that the waste issue was very important to Fianna Fáil (eh since the crisis arose) cleverly calling on the Government to defer pay x weight and not demanding it be abolished, as FF knows an EU directive can’t be abolished. Government plays just like the Irish team. Brady left it very late to get that brilliant goal that saw the Irish team go through for the first time into the group of 16, had he missed he would never have been forgotten for a different reason. However the Irish soccer team of old and new have a history of leaving things very close to the wire and sometimes pulling through and many other times not. Our governments have had a similar history be it Health, Nursing Home’s, Water Charges so any other examples one could cite, so often carrying out ‘damage limitation routines‘ instead of planning and getting it right. Water, Waste, Septic tanks & Promoted to EU. 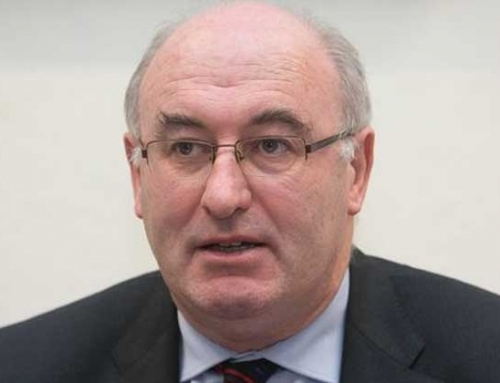 Just what is a Government Minister or a TD? Well they are people who are experts at getting themselves elected, stand for a local issue where a main party will not provide a candidate, or have a skill useful to a political party and they get them elected. So when they become a Minister at the behest of the Taoiseach they are given a portfolio sometimes in an area they are qualified in and often a portfolio they have no clue about at all. Hence they need advisors to look at issues for them, weigh up the facts and offer their best analysis for the Minister to pick one from hoping he gets it right. Did not do us much good with two qualified doctors as previous ministers for health, and the longest serving TD in the House Enda himself, well his long years of experience have not always served him well with his unrealistic achievements either. The point I am making is once you have political reversal of actions brought about by an angry segment of the people, a reshuffle of Government and change of governments every 5 years, no strategy that requires long term planning and commitment can ever be achieved. Look at the ESB our national energy provider does any Government minister tell the ESB what to do, no siree the ESB calls the shots all the time regardless of who is in power. The waste industry is privatised and will stay that way as the Government nor this country is prepared to handle its own waste. 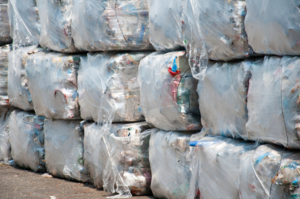 That said it is pure folly to suggest that the Government will tell the refuse companies what to charge, it will be the other way around as if the financial return is not sufficient then the private companies will simply pack up and go elsewhere to make a return on their investments. 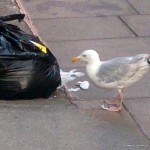 If we woke up one morning to having no private waste collectors, Government would be forced to go back to council collections that were draining the state of funding and once the Landfill directive came in from the EU all councils collectively got out of the waste collection business in 2011. A National Waste and Renewable Energy Authority. This is where we need to get real about the waste we produce, how we collect and process it, educate everyone in minimising waste production, really seeking to create a ‘Circular Economy” and not a ‘Linear‘ one, and most all avoid imposing monumental fines ‘in the Billions‘ on the citizens of Ireland for non compliance to the EU by 2020/25/50. Even qualified journalists keep getting the ability of Poolbeg so wrong when it comes to looking to it as the panacea of dealing with all our waste. 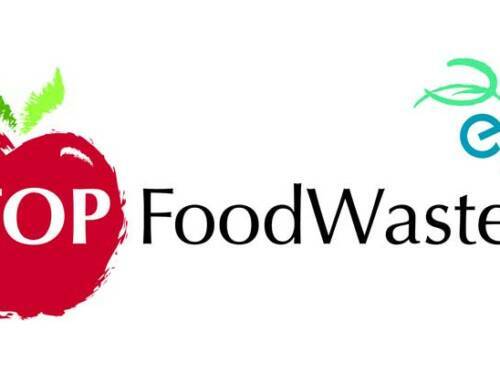 The simple fact is it can’t, no more than Indaver’s plant in Meath can recycle waste that is mixed with food or any bio waste. 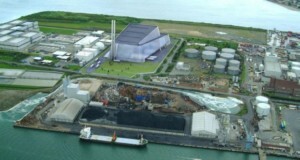 That segment must be removed first, then and only then can the remaining waste be processed as per the EPA’s licence implementations on any such plant on the Island of Ireland. Exporting from the Island of Ireland the Department of the Environment can export all the mixed waste it likes to Europe and enjoy the freedom of being the only country in Europe to be permitted to do so. What I have written above is comical yes in a football scenario, or a ‘Scrap Saturday’ pisstake, but it’s absolutely disgraceful in a Political context. Bag it and export it. 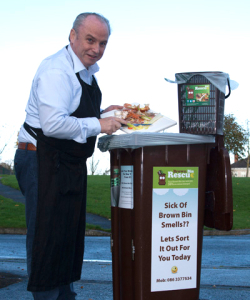 How can we even begin to take the whole issue of waste seriously when the media is full of spin from the ‘Joe Duffy Show sensationalising issues’ to political point scoring on ‘Morning Ireland, News at One to TV’s Six One’. Every single programme has it’s own agenda all trying to excite and interest the listeners (or ‘voters’ to the politicians) with no intention of having a holistic approach to solving the issue at hand. The real truthful and informative programmes such as ‘Eco Eye’ relegated to late night viewing on odd mid week nights, those type of fact based programmes give as it is and warn of the problems that inactivity will bring on the citizens of Ireland. A State backed TV station has to have a required amount of Green / Environmental programming but it’s only a token gesture to fulfill their license. Brown Bin A Household’s best Friend. Despite the ridicule and the spin of pay x weight the reality is that every household has to realise that the Brown bin is their best friend. 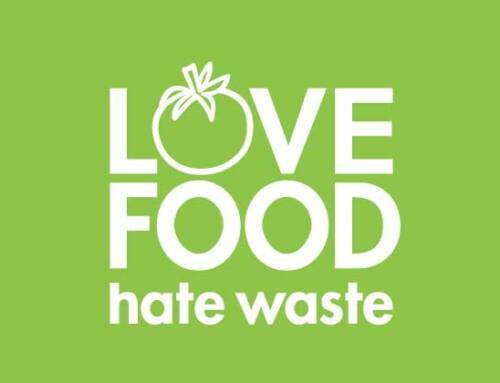 Yes it is and always will be the lowest charged for bin, be it by weight or by lift and dealing with the issues that come with managing a Brown bin, e.g odours and mess are easily addressed when compostable bin liners, bags and kitchen caddies are used. Every household under the licensing of pay x weight for refuse collectors July 1st 2015 was to see every household issued with a Brown bin before July 1st 2016. Let the refuse collectors fight it out with government but any household that has a Brown bin then learn how to use it properly, and any household that was not issued with a Brown bin must get onto their refuse collector. 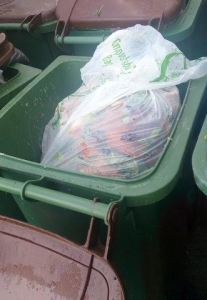 If the refuse collector refuses to provide a Brown bin then get onto the Department of the Environment and ask that the refuse collectors licence be suspended for non compliance with the Department’s rules and regulations for pay x weights introduction for refuse collectors on July 1st 2015.